Sailing Lessons with Great Lakes Sailing School - You are ready to sail! You are ready to learn to sail! Are you just curious about sailing or are you an aspiring captain? Our sailing lessons will help you find your sea legs. No experience is necessary to start our sailing lessons! We mainly operate in the Toronto Harbour area for your convenience. You have never been sailing. You want to grab a partner and see what it’s all about. All you need is an able body and a willing spirit. You like being out on the water. It’s time to learn the ropes! These lessons will give you the knowledge to be a competent crew member. You want to be the captain. With the completion of these lessons you will have the confidence and certification to captain a sailing vessel. You have never broadcasted your voice, it can be nerve-racking. Learn to operate Very High Frequency marine radios effectively and stay legal with this certification. You have a boat with a marine diesel engine. Maybe you’re not sure how to take care of it. We can take you through basic engine functions and simple maintenance. You want a very personal experience outside of a certified course. Sailing instruction, practical water safety, and outboard motor operation is available. Do you have questions about our courses? Contact us! Good weather conditions can always be found in Toronto’s Outer or Inner harbour due to the complex shoreline configuration. You will start learning as soon as you approach the boat at the dock. The first lesson is how to board the boat: what to grab and where to stand to be safe. You can choose several locations to begin your lessons. 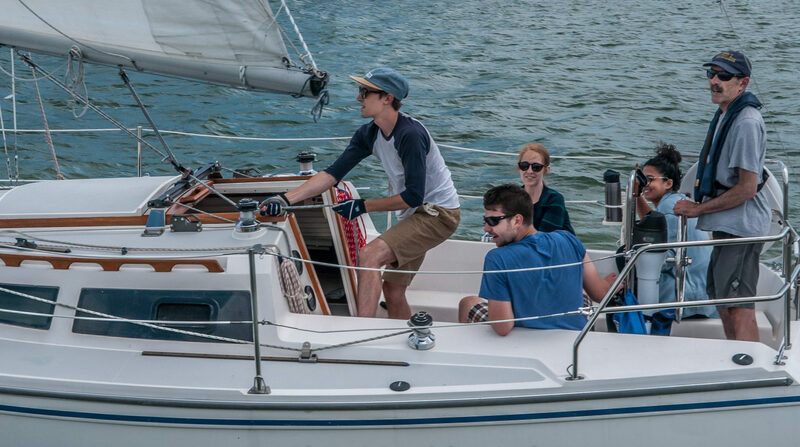 We will pick up groups by boat on the Toronto Downtown Waterfront, Outer Harbour Marina (free parking), or Aquatic Park Sailing Club (free parking) in Tommy Thompson Park. Alexei is by education and experience an aquatic ecologist. He has a passion for sailing and water sport. Alexei has extensive practice cruising the waterways around Ontario. Therefore his 40 years of sailing history make him an ideal sailing instructor. Alexei is a Sail Canada certified instructor. He has worked as an instructor in Toronto before starting Great Lakes Sailing School. He is dedicated to the best practices in safety, boat handling, and boat maintenance. This web site is created by Great Lakes Sailing School.